Distance makes the heart fonder, retrieves more intense? Bang! And a cloud of feathers, the pellets barely slowed the wing-clipped chukar. It soared over plowed furrows, a creek, and finally bounced into a thicket of willow. Manny was off and running, until he hit the fallow ground where he did a pretty good imitation of a Chinese acrobat: a flawless somersault, ending up on point, dazed and confused but only momentarily. The pup got his bearings and rocketed for the dead bird’s last known location, still 100 yards away. Like football fans in a luxury box, we watched from the high ridgeline where we’d sort-of shot it following a beautiful point by Buddy and honor by his nephew. Buddy, not one for retrieving when anyone else volunteers, was already hunting again. Even at a distance we saw the unmistakable pause, pounce and head nod that described a quick re-arranging of bird in mouth for a secure carry – we were assured he’d found the bird. Manny streaked around the plowed field, taking the longer but more secure route through the sage. 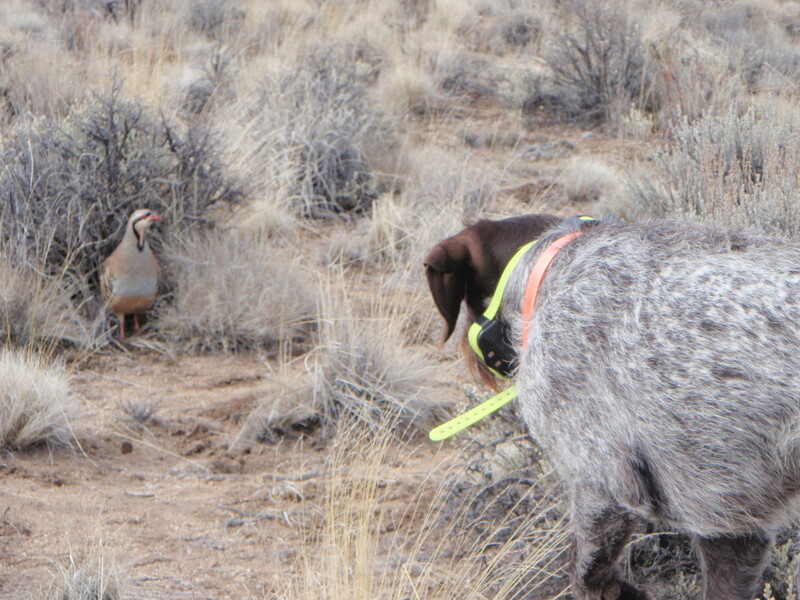 Before he knew it, he was delivering the chukar to my hand, a skill not yet perfected in our training regimen. Holding fast to his collar, I gave it back for a moment, letting him savor the smell, taste and feel of the precious bird. As he relished the bonus in his pay envelope with snorts and snuffles, the wheels started turning in my head. Is there something in the long distance run and 50-yard-line view that helps a pup focus, become a bit more single-minded, and bear down on the work at hand (at paw?). Retrieving training at home, on the table and in the yard is going fine, but lacks the intensity of yesterday’s performance. Sure, gunfire, other dogs, people and new surroundings pump up the adrenaline level. So does a live bird, rattling out of its sagebrush hidey-hole, kee-kee-ing its way skyward, then silenced by a boom! But does a young dog find singleness of purpose when he sees a bird glide and land so far away? Does he do the canine equivalent of cartoon workmen who spit on their palms and rub them together before picking up the sledgehammer? I do believe distance plays a major factor in a dog’s retrieves. When faced with a retrieve of under 50 yards, my red setter will run to the bird, pick it up, and moments later drop it to return to hunting. However, when a bird is winged, and glides for 200 yards or more, Shea, without a doubt will charge hard after it, and return to us, head held high and bird in mouth. I have yet to figure out what drives her to only chase the long shots, but in the end, I’m just happy that she’s doing the chasing and not me! Yeah, but I wonder why? Perhaps they do this to insure the bird will not get away. If the dog goes to a short kill, finds the bird dead and sees the hunter within an acceptable distance, he is sure the bird can not escape and continues to hunt. On the other hand, on a long retrieve, he gets to the bird, but knows the hunter is a great distance away. In this case, if he does not deliver the bird to the hunter, the bird escapes in a sense. That is the best explanation I have to offer. I think just about every dog enjoys a retrieve in a field more than a retrieve in the yard. The only time I see as much enthusiasm in the yard is when I use the dummy launcher in the yard. Something about the big “pop” as it soars will have Luna fired up even when I make her whoa until sent for the retrieve. Kudos to manny though for marking well enough to find such a long fall. Upside of lower cover I guess too. I think the combination of being out in the field, and them knowing what they’re there for.. Being able to hunt down the bird themselves and then the shot. All comes together to give a extra boost. Now I’m wondering if dogs produce adrenaline? Fired by great big booms.